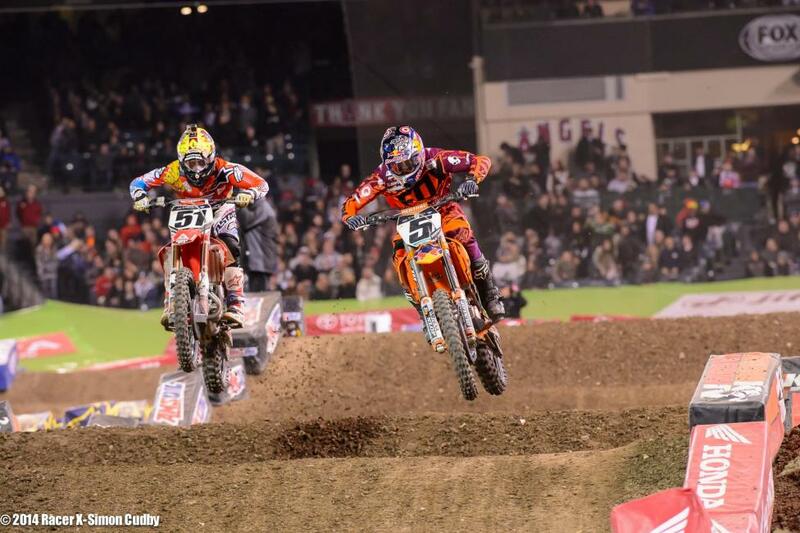 Monster Energy AMA Supercross, an FIM World Championship, hosted its third and final 2014 stop inside Angel Stadium on Saturday night in front of 42,139 fans. 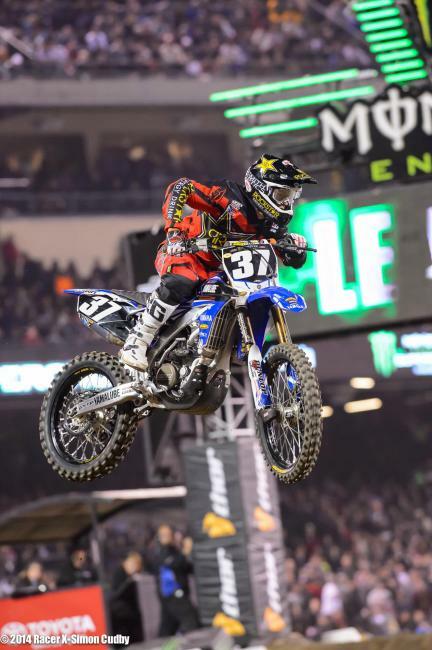 Discount Tire Racing/TwoTwo Motorsports’ Chad Reed led all 20 laps of the 450SX Class Main Event to capture his second win of the season and his second straight in Anaheim. 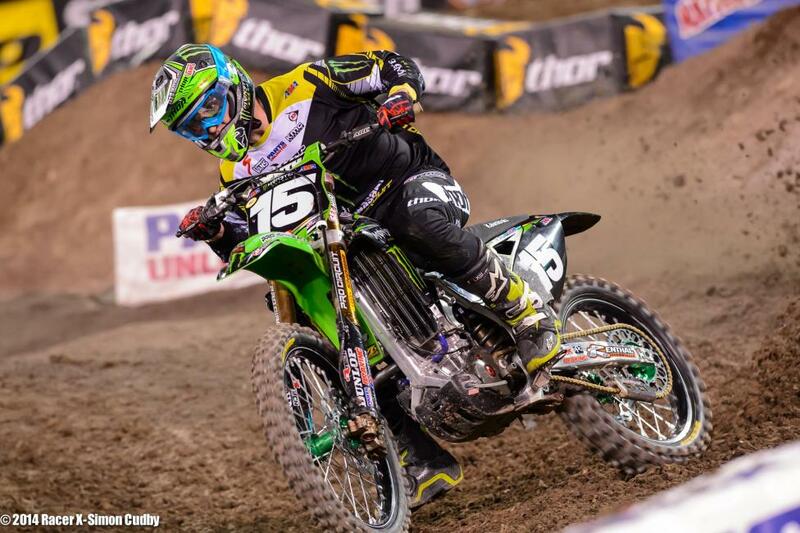 Monster Energy/Pro Circuit/Kawasaki’s Dean Wilson won his first race of the year in the Western Regional 250SX Class. 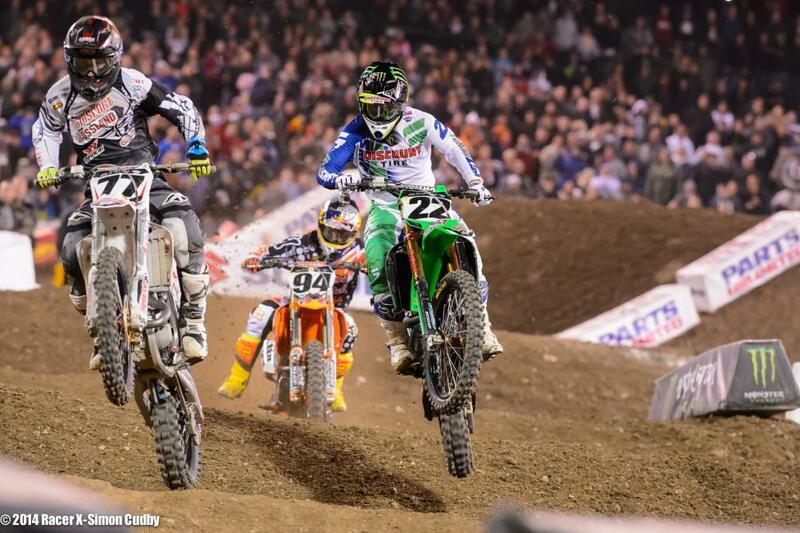 Reed moved to within two points of Villopoto in the 450SX Class standings. Villopoto’s third-place finish was his third podium result of the season. The previous Monster Energy Supercross round at Angel Stadium in Anaheim, California, was one for the ages, with Chad Reed winning in epic fashion on his Discount Tire Racing Kawasaki. 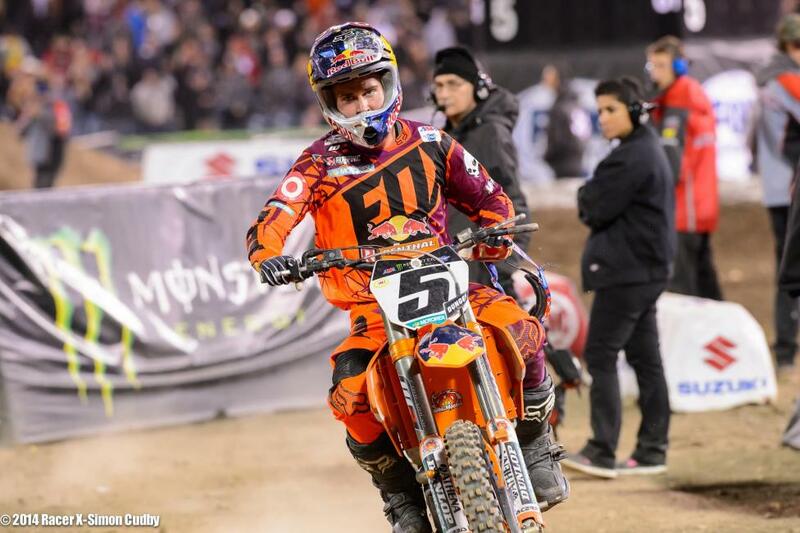 This race turned out to be a battle between the ages--with Reed, the veteran contender, squaring off with Red Bull KTM's teenaged rookie sensation Ken Roczen for the win. 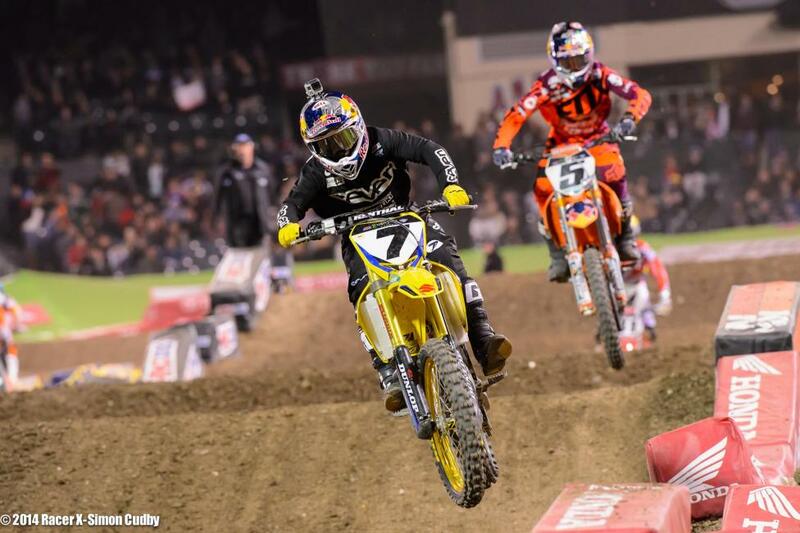 And they went toe-to-toe for 20 laps, with Reed ultimately emerging with the win again, and Roczen a close second. With both distancing themselves from series points leader Ryan Villopoto by the finish, it confirmed a single theory--both the kid and the old guy are in this title fight, for real. At the drop of the gate, Yoshimura Suzuki’s James Stewart and Monster Energy Kawasaki’s Villopoto went through the first corner of the 450SX main event side by side. 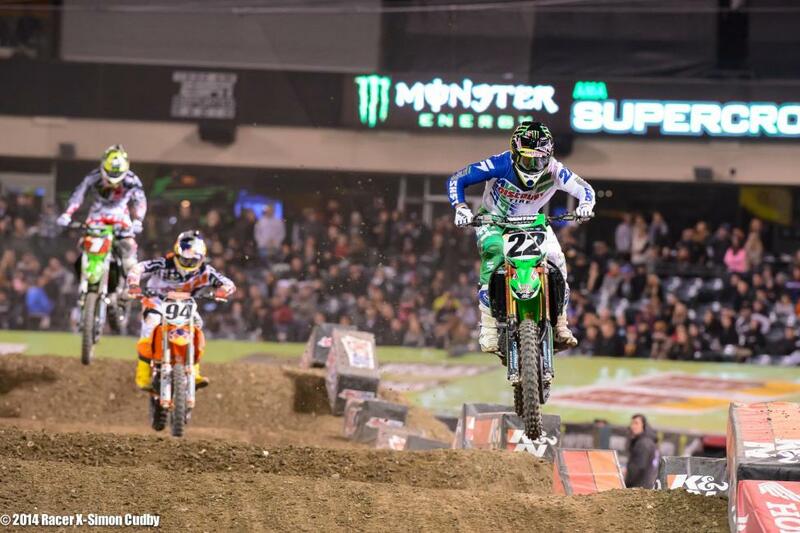 Villopoto held onto first as Stewart was quickly shuffled to fourth. Villopoto had the lead, but wasn’t able to hold onto it for long. 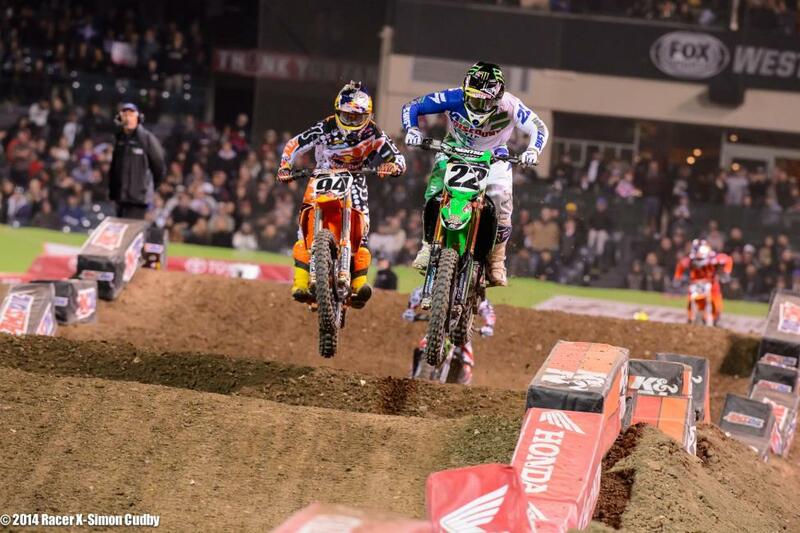 On the first lap, Reed made a charge through the whoops and got past Villopoto on the inside of the following corner. Roczen was also right there was able to get by Villopoto in the same spot on lap three. The lead trio pushed hard, but then a second battle materialized behind them with another three-pack. 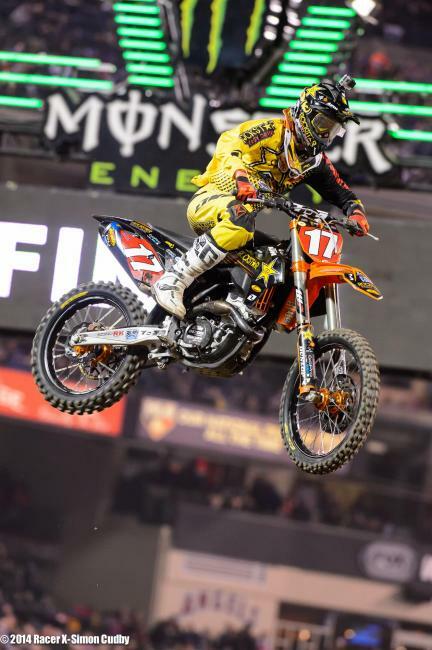 Stewart was the first of the front-runners to bust out the big triple-quad jump through a rhythm lane, and fifth-place Ryan Dungey (Red Bull KTM) soon followed suit. It might have been a slight advantage, but it didn’t separate the riders by a lot. At the halfway point of the race, the top-six riders were all close: Reed, Roczen, Villopoto, Stewart, Dungey and Muscle Milk Honda's Justin Barcia. Then Dungey ran it in on Stewart in a 90-degree right-hander and took Stewart down and out of the mix. 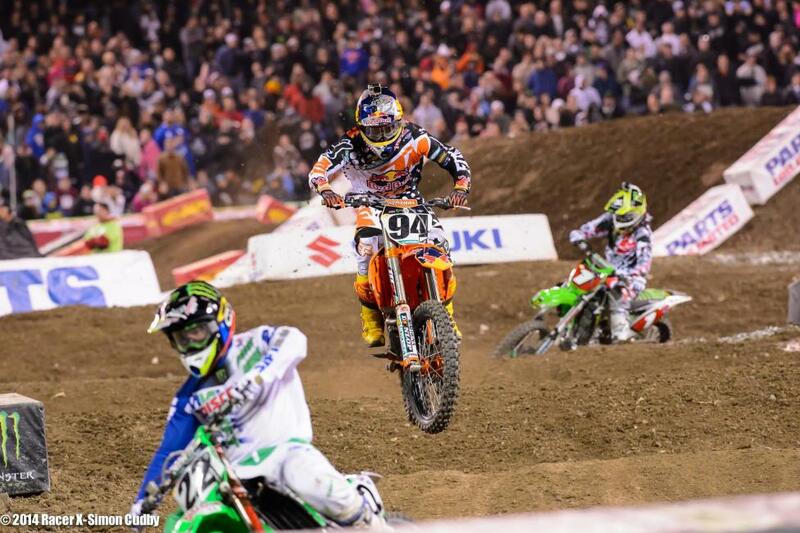 Dungey then crashed all by himself exiting the large whoop section the next lap. The crash resulted in a broken clutch lever—and possibly more—and gave Dungey a fit as he tried starting the bike. With the clutch lever hanging off of his bars, his night was done. Before the Dungey crash, a resurgent Barcia was pressuring the KTM rider, and when Dungey went down, Barcia was set for a season-best fourth. Up to about lap 15, Roczen continued to press Reed, and Villopoto would still get close enough at times to apply the heat. Then Villopoto finally fell off of Reed and Roczen’s mark with three laps to go. Roczen closed in on Reed after every minor mistake, but Reed also capitalized on any flaws from Roczen. They seemed to have diferent sections on the track where each was faster, and things started getting ver close on the final lap. Reed almost had an issue getting by lapper Jimmy Albertson (who obviously had no idea what was going on behind him) through the last few corners, but it didn’t affect the outcome of the race. Reed took his second win of the season with Roczen and Villopoto rounding out the podium. Lucas Oil/Troy Lee Designs Honda’s Cole Seely kicked off the 250SX main event with the lead, but Monster Energy/Pro Circuit Kawasaki’s Dean Wilson—the fastest rider in the class all day—pulled in behind Seely for second. Points leader Jason Anderson started in sixth and began working his way through the pack, but Malcolm Stewart attempted a pass that ultimately sent both riders to the ground. 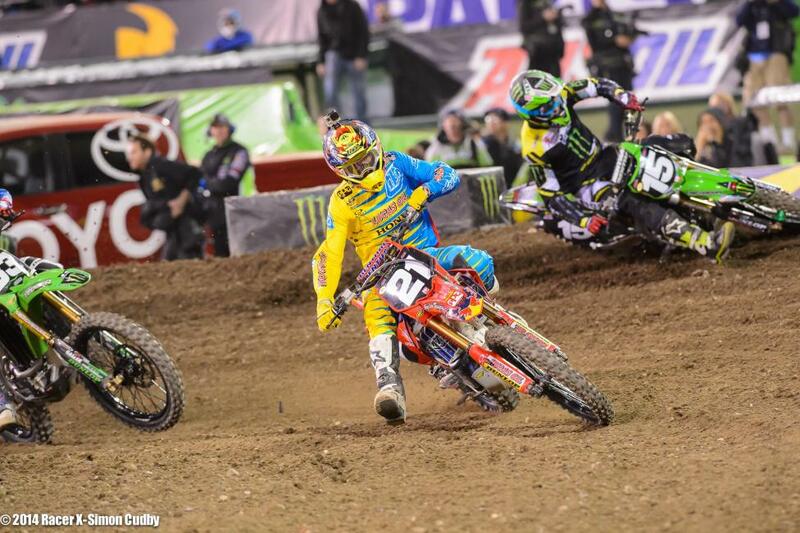 Seely began pulling out from Wilson and looked comfortable at the halfway mark. Jake Canada held onto third for some time before succumbing to pressure from Cooper Webb. 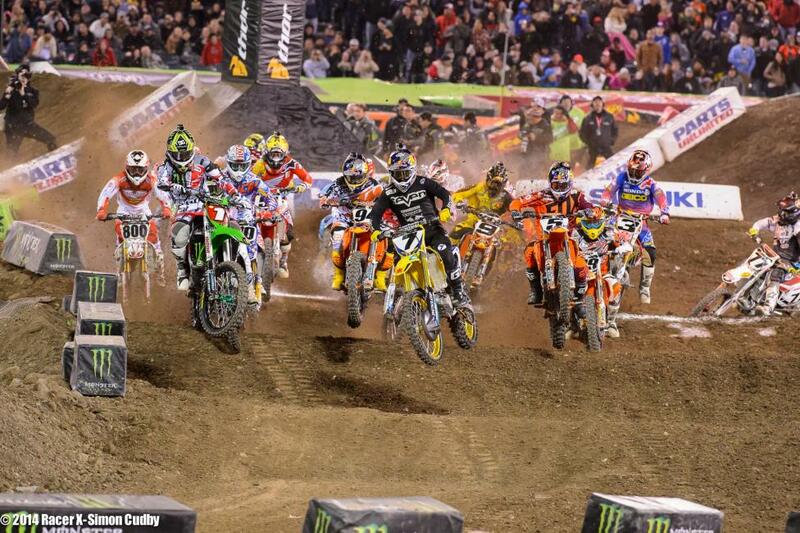 Webb was too far back from Seely and Wilson to give any immediate challenge once he passed Canada. Wilson was slowly catching Seely, and the race looked like it could come down to the last lap, but Seely low-sided in the right-hander after the whoops and gave up the lead to Wilson. Wilson, who also got caught up in the ruckus a little bit, went on to take his and Monster Energy/Pro Circuit Kawasaki’s first win of the season. 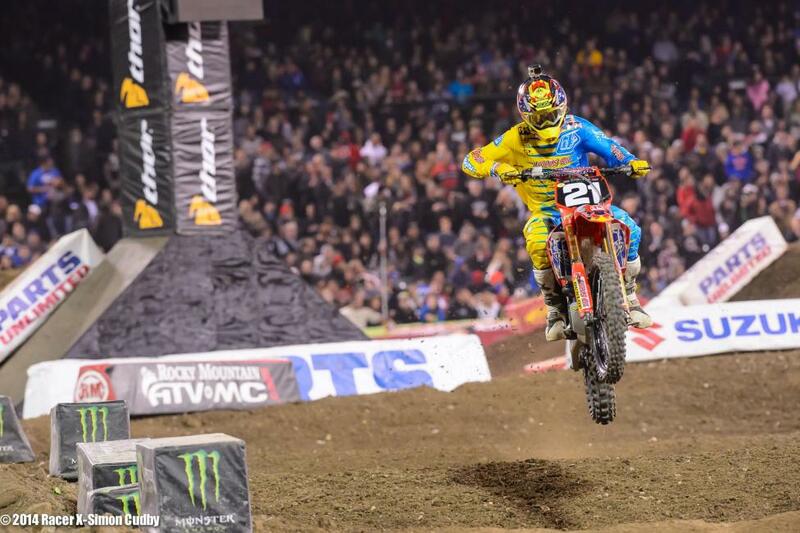 Seely remounted for second and Webb took third. Anderson was able to salvage a fifth for his championship hopes.